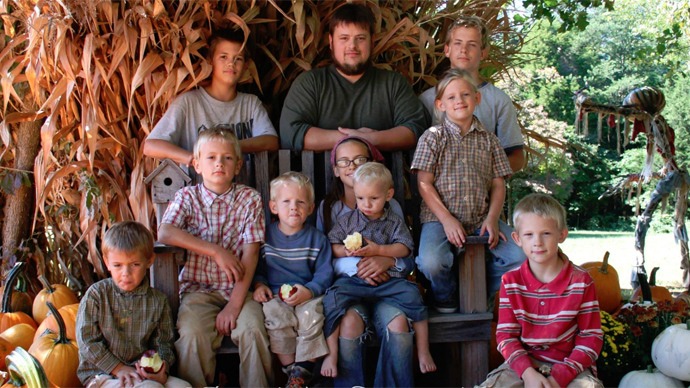 A Kentucky 'off the grid' family is trying to get back their 10 children, seized by the authorities last week. Critics are calling the living conditions on the family farm “unsafe,” but friends say the parents were targeted because of their lifestyle. Joe and Nicole Naugler attended a custody hearing Monday morning before a Breckinridge County judge, asking to have their children returned. Kentucky Child Protective Services (CPS) placed the children in four foster homes after sheriff’s deputies raided the Nagle farm last week. Police had gone out to the farm after a neighbor claimed that Joe Naugler had threatened her with a gun – allegedly kept inside his truck – after she refused to allow him access to the water well on her property. The neighbor also made claims about the family’s living conditions, saying the family was living in a tent, without running water or sewage, and the children were not enrolled in school. When the deputies arrived, Joe was away with eight of the children. Nicole, five months pregnant, refused to allow her teen sons to be interviewed without a search warrant. When she tried stopping the police from interrogating them, she was arrested for disorderly conduct and resisting arrest. The Nauglers allowed the CPS to take their children when they were threatened with felony charges, but say they intend to fight to get them back. The report by the state’s Cabinet for Health and Family Services (CHFS), lists the family’s living conditions as a secondary concern, and says the children were taken away because of the parents’ obstruction of the investigation. “Due to lack of cooperation with the Cabinet’s investigation along with the living conditions of the family… CHFS does not feel like the children are safe at this time,” the report says. Responding to numerous questions asked since the media began covering their story, the Nauglers defended their lifestyle and denied all allegations of wrongdoing. They said the family was living in a temporary cabin partly covered in tarps, because they were planning to build a more permanent structure later this year. Nicole has a job as a pet groomer, while Joe works the farm and takes care of the children. They do not receive any government assistance, and their lifestyle is perfectly legal in Kentucky, they say. Multiple people have stopped me at the courthouse to tell me they support the Naugler Family and hope they get their 10 kids back. The case has prompted polarized reactions on the family’s Facebook page and in social media, with commenters either supporting their determination or denouncing them for denying their children a “normal” life. “These people are nothing but trouble and are now reaping what they sow,” one critic wrote on Facebook, claiming to know the couple from the Church of Latter-Day Saints in nearby Elizabethtown. While the debate about the merits of the Nauglers’ lifestyle rages on, there is no denying that the US authorities are cracking down on “free range” parenting. Last December, Maryland police detained the two children of a Silver Spring couple after they went to the park by themselves. Maryland CPS accused Danielle and Alexander Meitiv of neglect, and threatened to send their children to foster homes unless the Meitivs “committed to a safety plan,” reported ABC News. The couple, both scientists, told ABC’s Nightline in January that they believed in “free range parenting” of their 10-year-old son and 6-year-old daughter. “Frankly I think that raising independent children and responsible children and giving them the freedom that I enjoyed is a risk worth taking,” Danielle Meitiv said.